This work was presented in September 2017 at the IV International Seminar on ORC Power Systems, in Milano (Italy). An updated analysis was developped in collaboration with Marco Astolfi and published in Energy Procedia. The full article is available here. The Organic Rankine Cycle (ORC) technology is a way to convert heat into electricity. Its main applications are distributed electricity generation from renewable heat sources (geothermal, biomass, solar) and industrial energy efficiency (heat recovery from industrial processes). 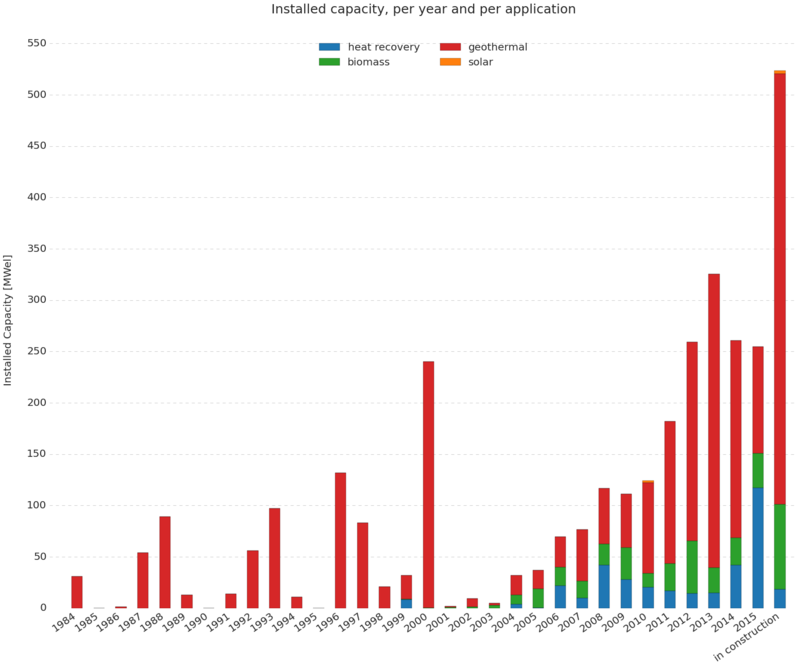 This report gives an overview of the installed ORC capacity over the years for different markets, all over the world. The data comes from the websites and list of references of ORC manufacturers. When possible, multiple sources (press articles, scientific papers) have been compared. In addition there are other manufacturers that have not published their list of references and declined to take part to the survey. Therefore this work does not pretend to be exhaustive, even if most of the ORC power plants have been taken into account. This survey aims at presenting the progress of the ORC technology over the last decades, for commercial applications. Therefore, lab-scale prototypes have not been included. In addition, references with total installed capacity lower than 50 kWel have been discounted. We have considered that below this threshold the technologies used are different and involve different stakeholders and markets. Geothermal power plants contribute to 76.5% of all ORC installed capacity in the world. Biomass follows with 10.7%. Heat recovery from gas turbines (compressor stations along pipelines) and stationary Diesel power plants has a similar share with 8.5%. 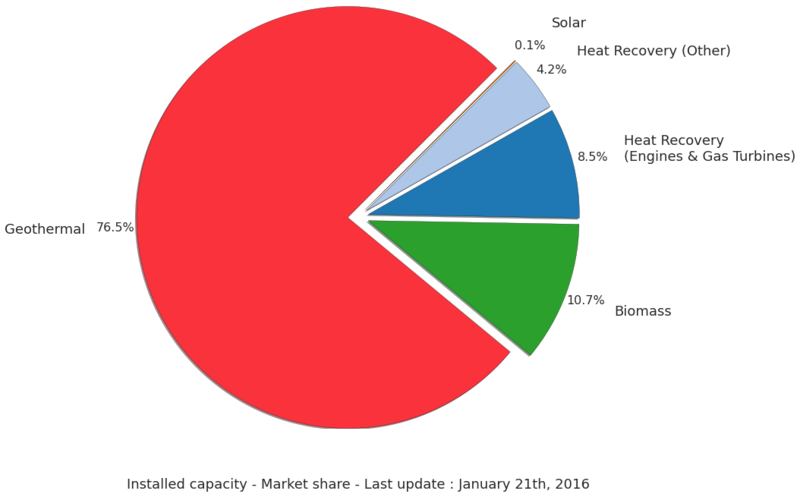 All other heat recovery applications represent 4.2%, while solar thermodynamic remains neglectible. 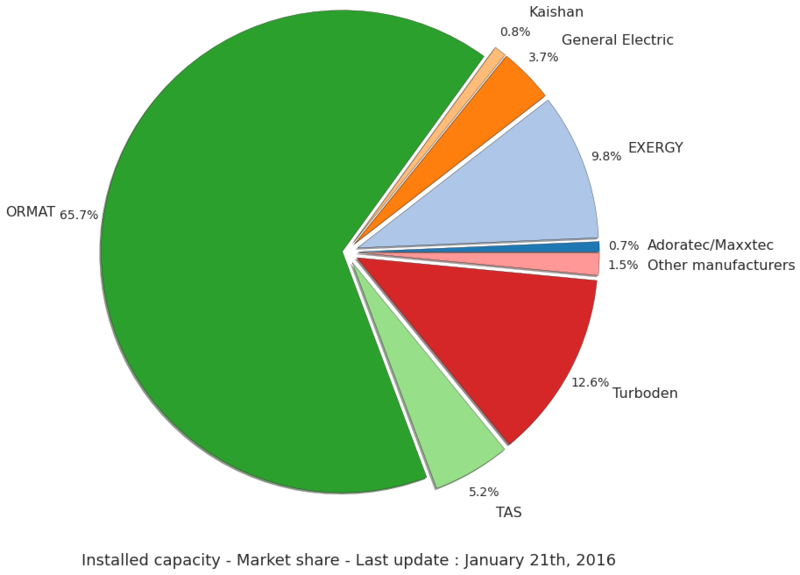 ORMAT is the world leader for the total installed capacity (65.7%), followed by the Italian companies Turboden (12.6%) and Exergy (9.8%). 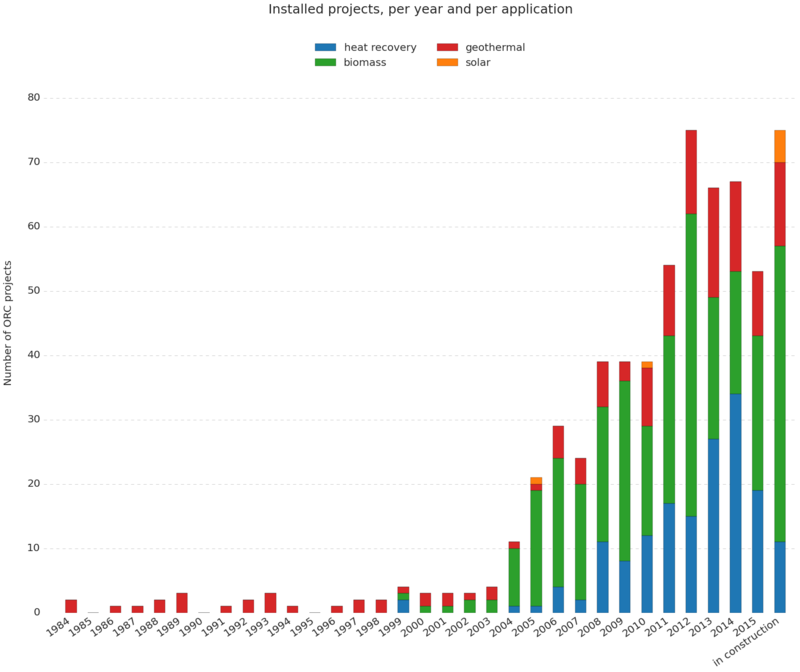 The following figures give the installed capacity and number of projects that were commissioned per year and per application. The market peaked in 2013, with 325.5 MWel of new capacity. Since then, we can notice a slo down in 2014 and 2015, with roughly 250 MWel being installed each year. This may be due to a decline in geothermal applications, related to low natural gas prices and competition against solar and wind (especially on the US market). 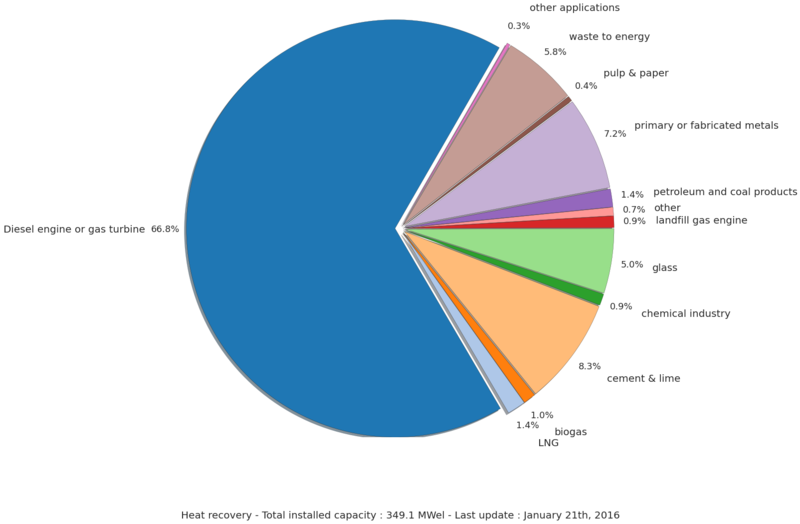 The heat recovery market has grown significantly over the last three years, from 14.5 MW in 2013 to 116.8 MW in 2015. 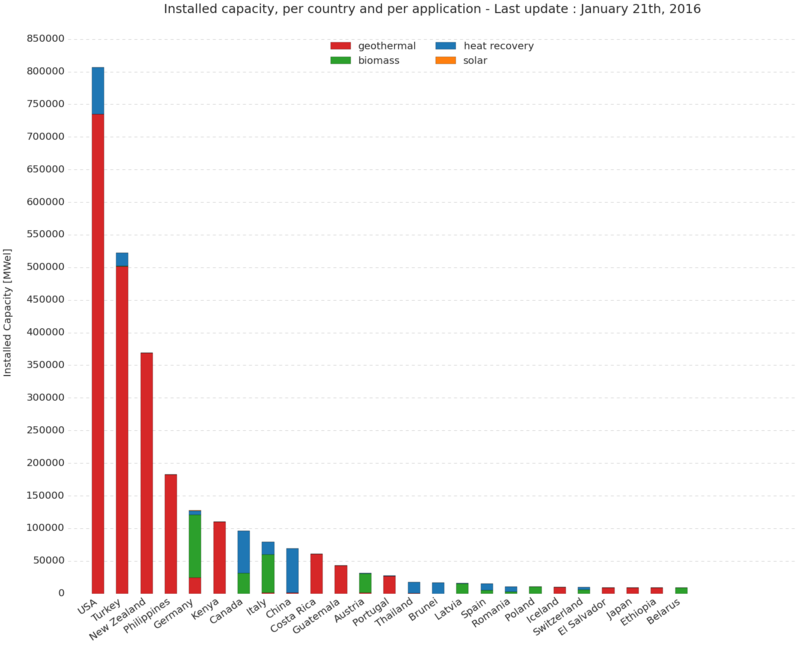 The United States has the largest installed capacity per country, followed by Turkey, New Zealand, and the Philippines. These four countries benefit from abundant geothermal resources. Germany and Italy are the most significant for biomass, mainly due to favorable policies, followed by Canada and Austria. The biggest shares for heat recovery are in the USA and Canada, mainly for waste heat recovery from compressor stations along gas pipelines. 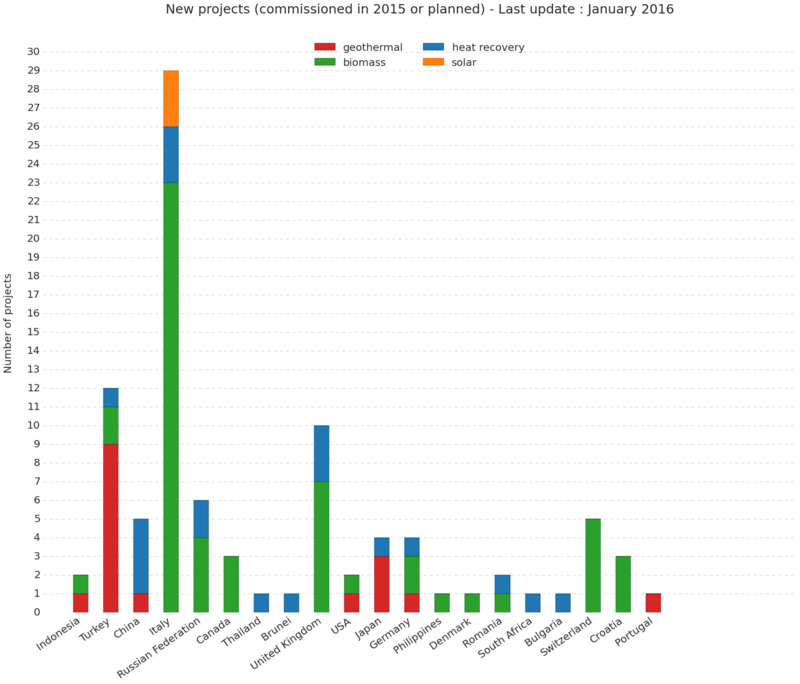 The following figures look only at projects that were commissioned in 2015 or have been planned. Of course, all new projects for 2016-2017 haven't been announced, but we can see that most of the new geothermal development is focused on Turkey, with 9 new projects. The large share of Indonesia is caused by a single new 330 MWel ORMAT project in Indonesia. Biomass development continues in Italy, Russia, Canada and the United Kingdom. However, the average size of biomass ORC installed in Italy is below 1 MWel, while new plants in Canada and Russia have an average power output above 4 MWel, mostly for saw mills. 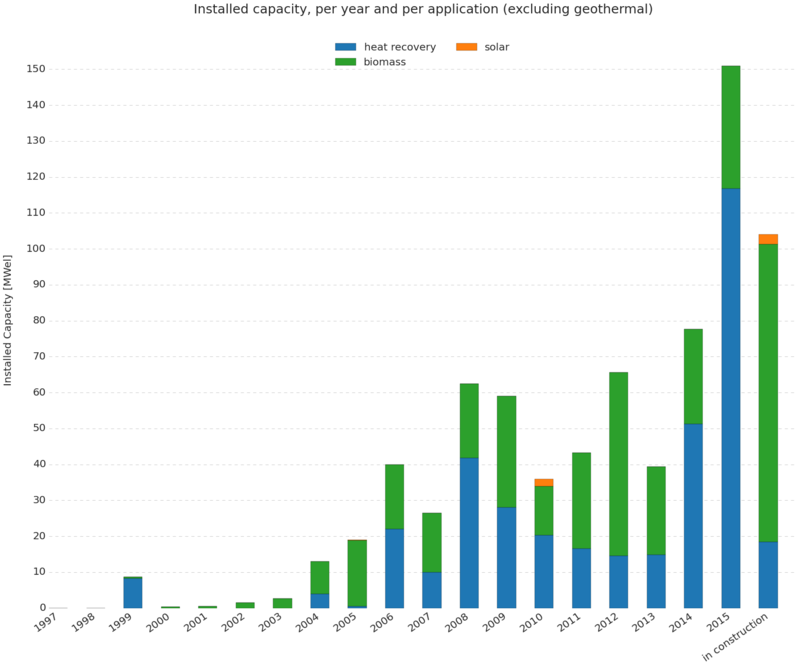 With 349.1 MWel of installed capacity in the world, and 18.5 MW of new capacity in construction (10 projects), the heat recovery market is still at an early stage but has long passed the demo/prototype phase. The main application is waste heat recovery from Diesel engines or gas turbines, with 66.8% of the installed capacity (41 projects). These units are mostly installed on compressor stations along gas pipeline, or on Diesel power plants. Cement & lime plants are the first industrial application, with 10 projects and a total installed power of 29 MWel. Waste to Energy (incineration) and metal industries (steel, aluminum, foundries...), have similar shares with respectively 12 and 24 projects. Biogas and landfill gas engines together account for 6.2 MWel of installed capacity within 35 projects. 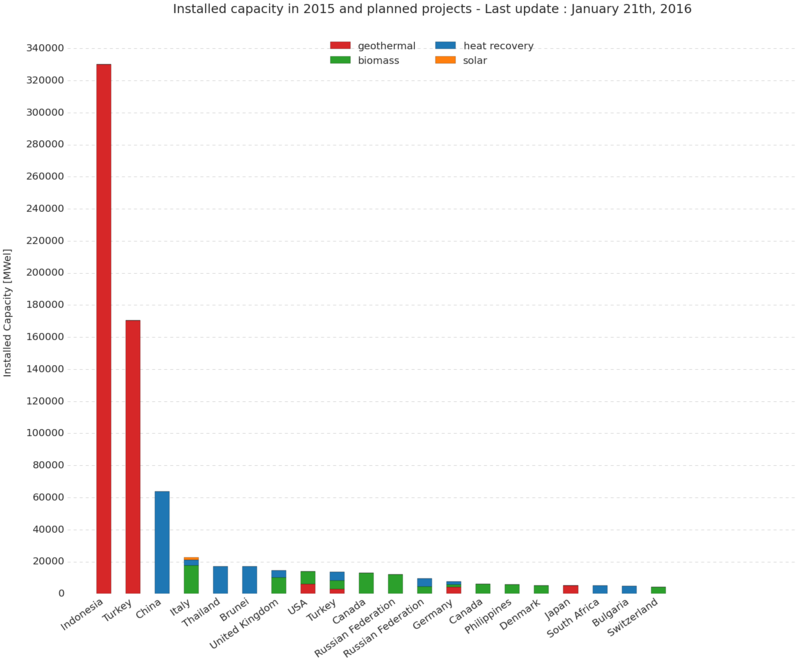 Please note that projects below 50 kWel have been ignored. This survey shows the development of the ORC technology over the last decades. Without pretending to be exhaustive, most of the projects installed in the world have been taken into account. Geothermal power plants are still the main applications in terms of power output, but the last year have seen an increase in biomass and heat recovery applications. The information contained in this website is for general information purposes only. While the author endeavours to keep the information up to date and correct, the author makes no representations or warranties of any kind, express or implied, about the completeness, accuracy, reliability, suitability or availability with respect to the website or the information, products, services, or related graphics contained on the website for any purpose. Any reliance you place on such information is therefore strictly at your own risk. In no event the author will we be liable for any loss or damage including without limitation, indirect or consequential loss or damage, or any loss or damage whatsoever arising from loss of data or profits arising out of, or in connection with, the use of this website.